Whether you like the popular Boston-based blog Barstool Sports or not (and there doesn't seem to be much middle ground on that issue), you have to agree that it is something of a regional force on the web. As evidence of that last point, you could read this recent article in The Maine Campus, the student newspaper of the University of Maine, which notes the site's growing readership at that institution. Why are we referencing an article from UMaine? Well, maybe because when they visit the site, they'll find themselves reading The New Hampshire. That's right. 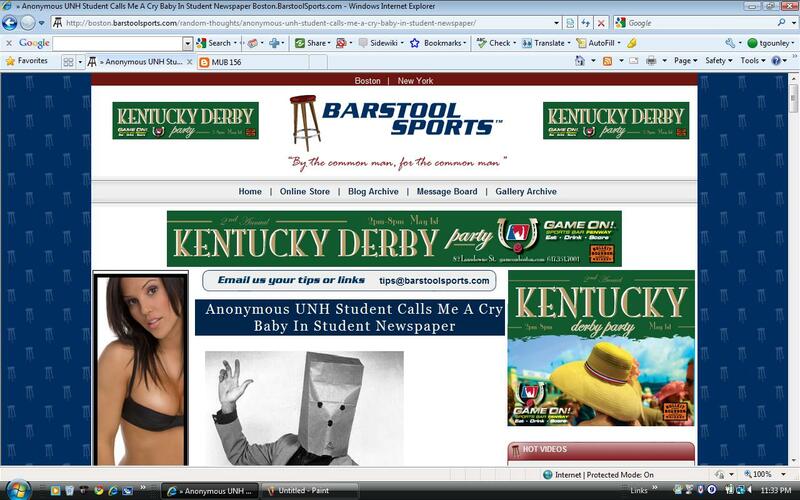 On Tuesday, in addition to getting our stories about Scott Sicko featured on Huffington Post's college section, one of our regular columnists got called out on Barstool in a post entitled "Anonymous UNH Student Calls Me a Cry Baby in Student Newspaper." Now this is the point in the post where we note that as a columnist, The New Hampshirite's views are strictly his own and do not represent the official views of The New Hampshire or its staff. But we are content to sit back and watch the rise in page views that it gave TNHonline.com on Tuesday. If you missed it, you can read The New Hampshirite's original column on TNHonline. 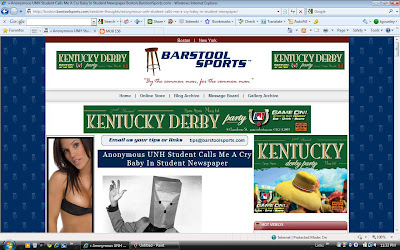 It was mostly about SCOPE and MUSO, two on-campus organizations that book concerts, and what students think of them, but it did call the author of Barstool Sports-Boston a "crybaby" (one word, not two; we actually looked that up in the newsroom to make sure we had the correct usage). Our advice: read both the article and the post, and get on one side of the fence or the other.